In generations past, the array of baby paraphernalia needed by new parents was carried in cumbersome totes of heavy plastic, often emblazoned with prints and patterns that spoke more to infants than to adults. [post_ads]But the style stork has delivered some smart-looking new options for moms and dads, with clever features to match. 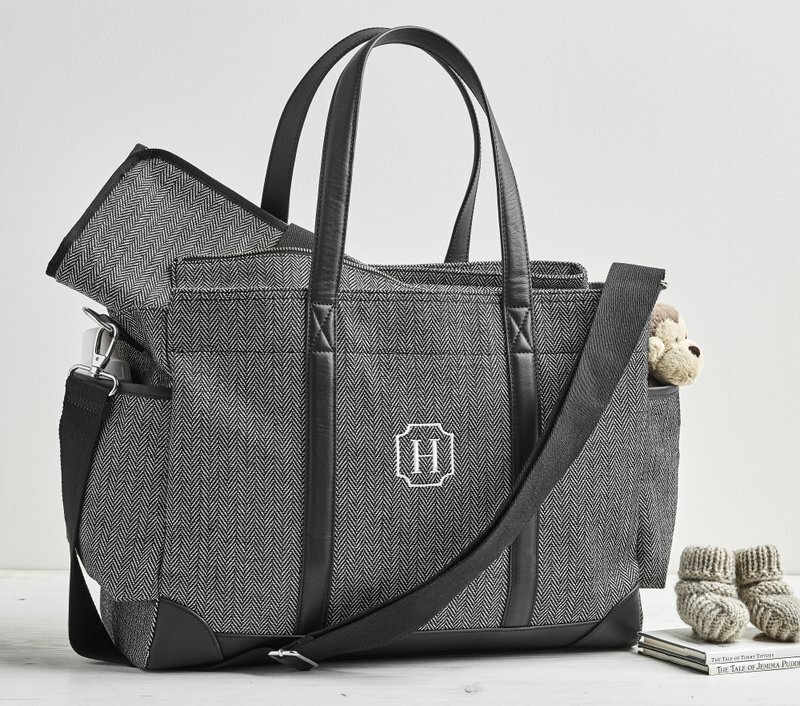 The diaper bag — what some have termed “the mobile nursery” — typically has a bunch of compartments that are good if you’re super-organized but can be frustrating if you’re in a hurry to find the wipes, teething gel or pacifier. Many new designs have fewer pockets, or consist of several separate mini bags. The best designs still have clever places to stow damp and messy things, and your phone and keys. KF Baby’s Bohemian diaper bag solves the sore-shoulder issue by supplying both cross-body and shoulder straps. 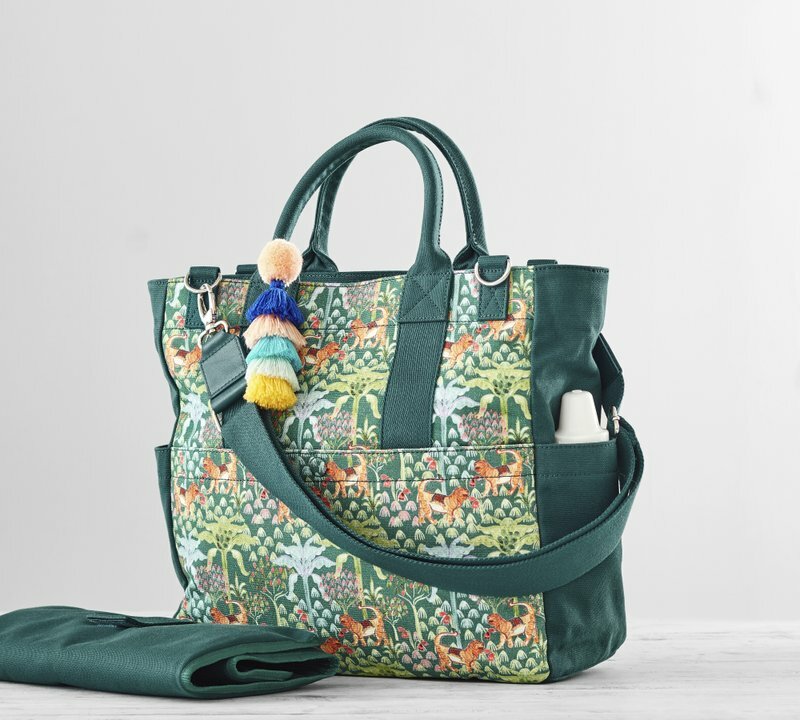 Besides a capacious main bag, there’s an insulated bottle holder and changing pad, all printed with a neutral-hued boho pattern that give it style chops beyond babyhood. Soho Designs offers multi-piece matching sets, available at Walmart, that include a padded changing pad, various accessory and bottle cases, and even a small purse. 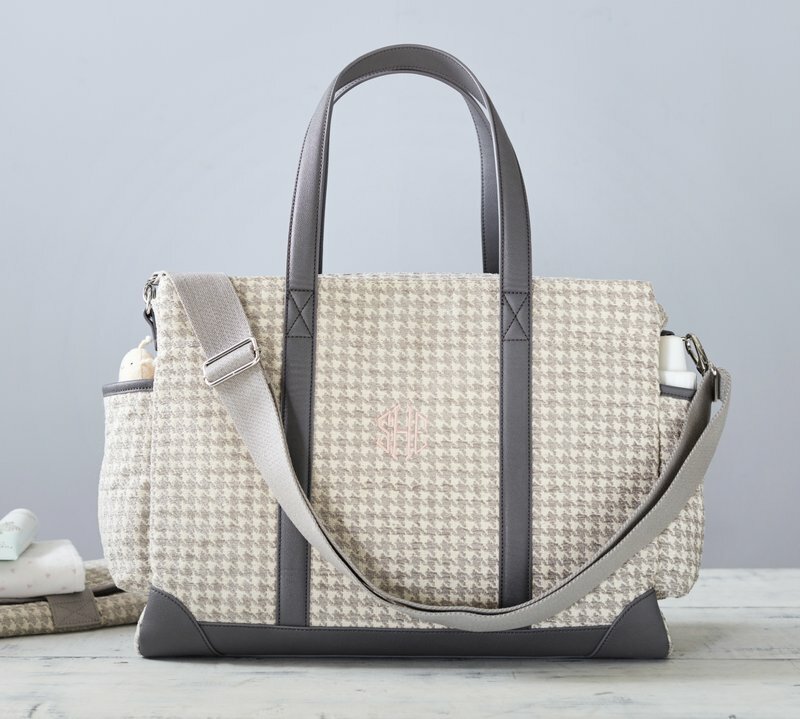 Pottery Barn Kids’ collection includes bags with houndstooth, linen and herringbone patterns, leather trim and a monogramming option. Here too are designer options from Justina Blakeney and Monique Lhullier, as well as baby-gear lifestyle brand Skip Hop. Designer DeNai Jones of Ventura, California, says that founding her brand, Petunia Pickle Bottom, before she had kids made the company her first baby. The line includes bags with global, floral and color-block prints as well as solids. With an integrated changing pad, magnetic closures, and materials like glazed canvas or vegan leather, these are trendy yet practical. 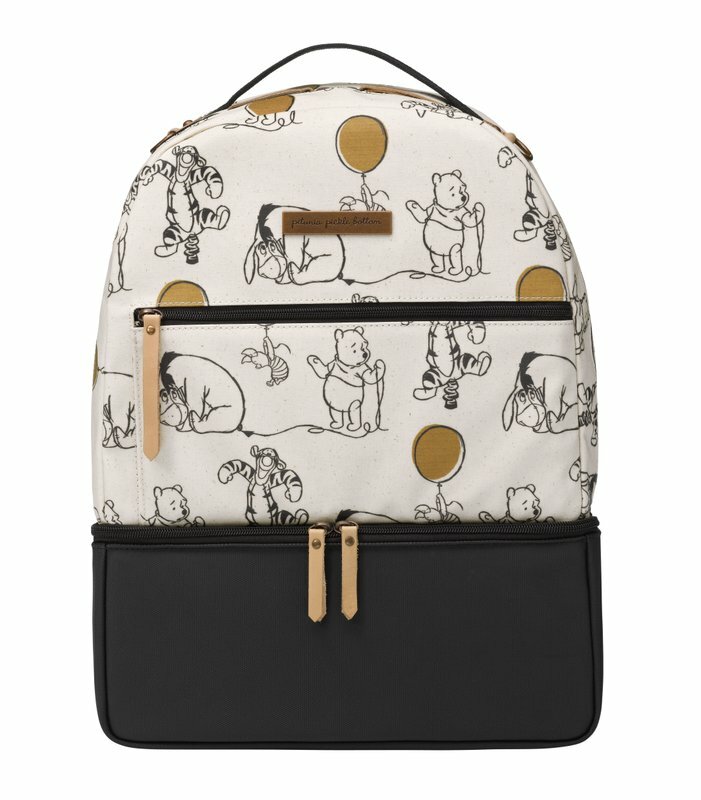 Diaper bags from JuJuBe, based in Costa Mesa, California, come in an array of fashion-forward versions including anime patterns; saucy, black and gray florals; cool coastal motifs; and an artsy Cheerios print. The machine-washable bags have two insulated pockets so you can keep your own beverage cool while baby’s bottle is in the other. Pockets are lined in light-colored, antimicrobial material so you can find things easily. Tiny bottom pocket holes allow crumbs to drain out. Quiet magnetic closures (instead of Velcro) won’t wake baby. There are also bags designed for fathers. These are a little more macho than a carrier with dancing Disney characters or gamboling lambs. Some dads like the backpack style, which avoids sore shoulders and makes it easier to lug the baby or other items up front. Plus you can ask your walking partner to retrieve something from it without having to stop and drop. Quiksilver’s utilitarian black Daddy Daybag has an insulated front pocket for water or kidlet’s bottle, a tablet pocket and a fleece-lined hanging pocket. 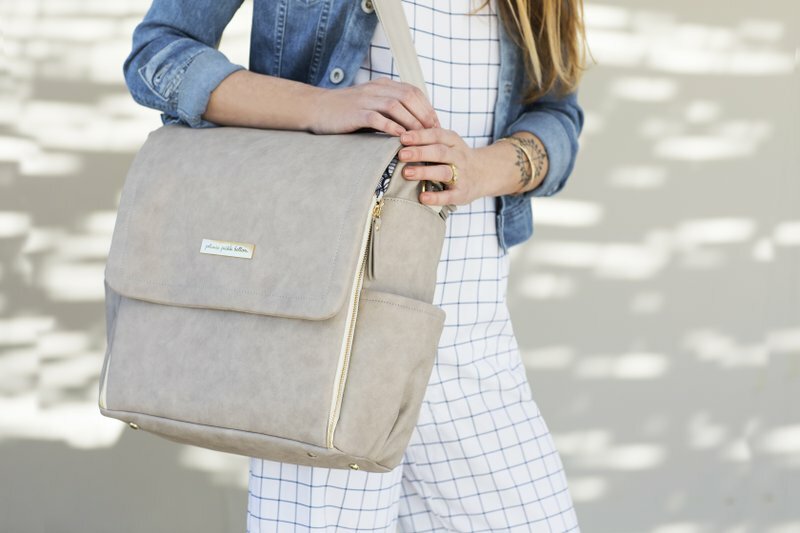 Another no-nonsense option: Seattle-based Kinbuilt’s clean-lined diaper bag. With quiet-close zippers, no extraneous buckles or flaps, a waterproof bottom, a clever stay-open design structure, and handy cards to list contact, medicine and allergy info, this bag also fits tidily under airplane seats. If you’re up for something really designed for tough baby-tending battles, check out Tactical Baby Gear, founded by Bev Brodie in Bluffton, South Carolina. His military-styled Deuce 2.0 bag made of rugged nylon can be customized with patches, as well as pouches that attach with military-grade MOLLE webbing. Bags are available in black, gray, coyote brown and camo. Other witty items in the line: a changing mat printed with “drop zone” and a target, and a compact, washable “dump pouch” for dirty diapers.